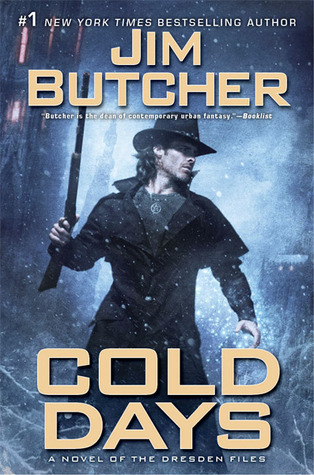 Cold Days by Jim Butcher comes out November 27, and I don’t know about you, but I’m pretty stoked. 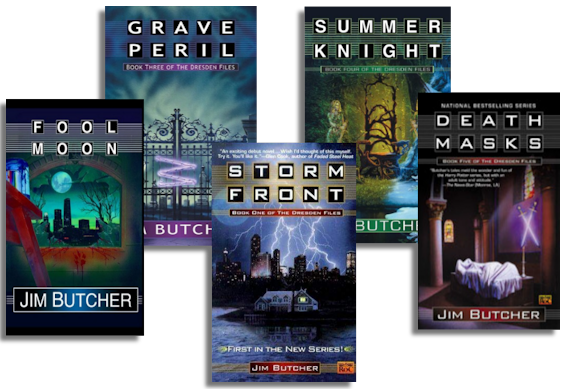 It’s the 14th book in Jim Butcher’s urban fantasy series following wizard Harry Dresden, the only openly practicing wizard in Chicago (and probably the U.S.). Of course, over the course of the last 13 books, Harry’s done a whole lot more than that – he’s pissed off a whole lot of powerful people (and non-people), faced off against the wizard council, squared off against demons, dodged death, and lodged himself quite firmly on my to-read list forever. When we last saw him in Ghost Story – but, no, this post isn’t about that. This post is about my own favorite thing to do outside of reading and blogging. It’s about browsing through covers and seeing how they change between editions. I see these covers in most every bookstore. They’re from Roc, a Penguin Group imprint and Butcher’s main publisher. Christian McGrath’s art creates a moody atmosphere that becomes more and more ingrained in Harry Dresden’s story as the poor guy continues to get mauled in increasingly creative physical and emotional ways over the course of the 13-book plot-line. As is proper in any noir-style detective story, Harry Dresden just can’t seem to catch a break. The series covers also convey another very important detail about the series. Harry’s cool. With his staff. And trenchcoat. And a dusk-filled urban landscape full of mysterious and deadly beasties. You might also recognize McGrath as the artist who has done covers for authors like Brandon Sanderson, C.E. Murphy, Seanan McGuire, David Gemmell, and Rob Thurman. For more art, you can visit McGrath’s gallery here. These covers take a half realistic, half surreal approach to the task of representing the novels. Each cover is a combination of an actual scene from the book, and a collection of items and images that convey the story (floating swords over a bed, glowing power on a gate, blood on the windowsill). I was both surprised and delighted to discover that these covers, used mainly for the audiobooks in the States, were illustrated by Lee MacLeod. Not ringing any bells? What about Christopher Pike’s Spooksville series? Yep, he did the covers for those books, and you can see some of his other works here. While the overall effect (and Butcher’s genre!) is very different from children’s horror, I imagine that I can see something of that style peering out at me from the covers in the color choices and the set-up of each scene. These aren’t the kinds of covers that would catch my eye from the book shelf, but then, one TV show and several graphic novels later, the series is already solidly established. This is an edition for readers who know what they want and how they want it – that is, in a full box set on their shelf at home. Of all the covers, this edition has my all-time favorite for Storm Front (innit lovely?). These special edition publications are released in limited amounts from Subterranean Press, a specialty sci-fi and fantasy publisher. The artist, Vincent Chong, has worked with a dozen publishers and some of the big name authors, so if you’re a fan of Stephen King, Joe Hill, and John Scalzi, you might recognize his style. But getting your hands on one of these might be easier said than done. According to the website, the press released just 500 copies of Storm Front (signed) and 25 leather-bound copies. All of the books are currently sold out, though it looks like you can add Side Jobs into your cart. Death Masks (release 2012?) looks to be the only book currently available, though the information on the website is somewhat ambiguous. You can see more art by Vincent Chong at his online gallery here. This entry was posted in Editorial, Urban Fantasy and tagged book covers, books, dresden files, harry dresden, jim butcher, reading. Bookmark the permalink. Why give Dresden a hat?